In Hearthstone, Hero Powers were core elements of each Hero's identity, and they were an ever-present part of your deck that you could tailor your strategy around. 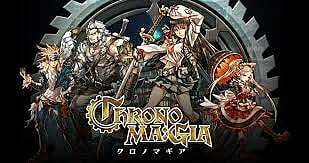 This is doubly true for CHRONO MA:GIA's Magia Skills because of the very specific costs associated with each Gifted's Magia Skills. 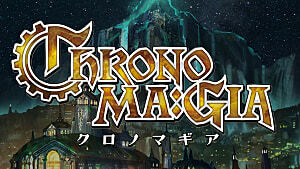 In fact, the Magia Skills you choose will often form the backbone for many of your decks. However, unlike in Hearthstone, you won’t have access to every Gifted right off the bat, which is problematic because, for whatever reason, you aren't able to check the Magia Skills of the unlockable Gifted characters … until you pay to unlock them. It's understandable that you might not want to waste your hard-earned Suit Pieces on guessing which Gifted you want based on their looks, so I did it for you. 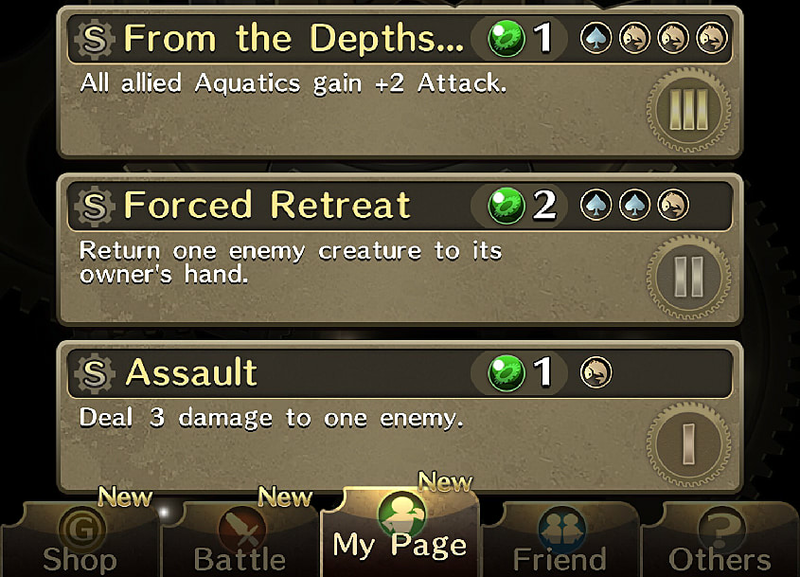 Assault (1 MP, Aquatic): Deal 3 damage to one enemy. Intimidate (1 MP, Undead): Your opponent loses 1 MP. Sleepy Strike (3 MP, Heart): Deal 4 damage to one random enemy. Nap Time (Spade, Heart, Undead): Restore 1 Life to yourself, and gain 1 MP. Assassinate (5 MP, Aquatic, 2 Undead): Instantly slay one random set enemy creature. Forced Retreat (2 MP, 2 Spades, Aquatic): Return one enemy creature to its owner’s hand. Desperado (1 MP, Heart, Club, Aquatic, Undead): Deal 1 fixed damage to random enemies four times. Nightmare Link (4 MP, Spade, Heart, Club, Undead): Deal 6 fixed damage to one enemy. From the Depths... (1 MP, Spade, 3 Aquatic): Return one enemy creature to its owner’s hand. Celestial Prayer (Heart): One allied creature gains +1 Attack. Sword Dance (1 MP, Club): Deal 2 damage to all enemy creatures. Paralyze (Diamond): Inflict Stun on one enemy creature until the end of your opponent’s turn. Miraculous Dance (4 MP, Diamond, Mortal): Resurrect one random Mortal creature from your graveyard. Must be a Common card. Temptation (1 MP, Heart, Club, Demon): Summon one random set enemy creature. It loses -1 Attack. Bewitching Light (Heart, Diamond): Increase the Cost of all your opponent’s creatures by +2 until the end of their turn. Omen of Death (1 MP, Heart, Club, Fae, Demon): Deal 2 fixed damage to all enemy creatures. Obliterate 1 card from the top of your opponent’s deck. Whirling Dervish (1 MP, Heart, 2 Diamonds, Mortal): Deal 1 fixed damage to all enemies. All allied creatures gain +1 Attack. 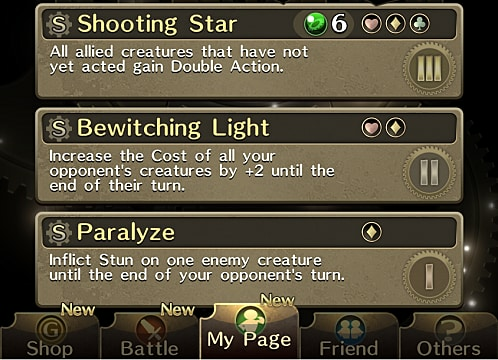 Shooting Star (6 MP, Heart, Diamond, Club): All allied creatures that have not yet acted gain Double Action. Reanimate (5 MP, Undead): Resurrect one random Undead creature from your graveyard. Does not apply to Legendary or Super Rare creatures. Dark Nova (Undead): Deal 2 damage to one enemy. Baleful Nexus (Demon): All enemy creatures lose -1 Attack. Black Magic (1 MP, Undead, Demon): The Costs of your opponent’s creatures increase by +2 until the end of their next turn. Stygian Nova (2 MP, Undead, Construct): Deal 3 damage to all enemies. Grave Summons (2 Demons): Draw 1 Undead card. Untimely End (1 MP, 2 Demons, Construct): Obliterate 1 card off the top of your opponent’s deck. Pernicious Pulse (1 MP, 1 Undead, 2 Demons): Deal 2 damage to all enemies. All allied Undead gain +2 Attack this turn. Terror Virus (2 MP, 3 Undead): Obliterate 1 random card in your opponent’s hand. Fire Talisman (Diamond): Deal 2 damage to one enemy. 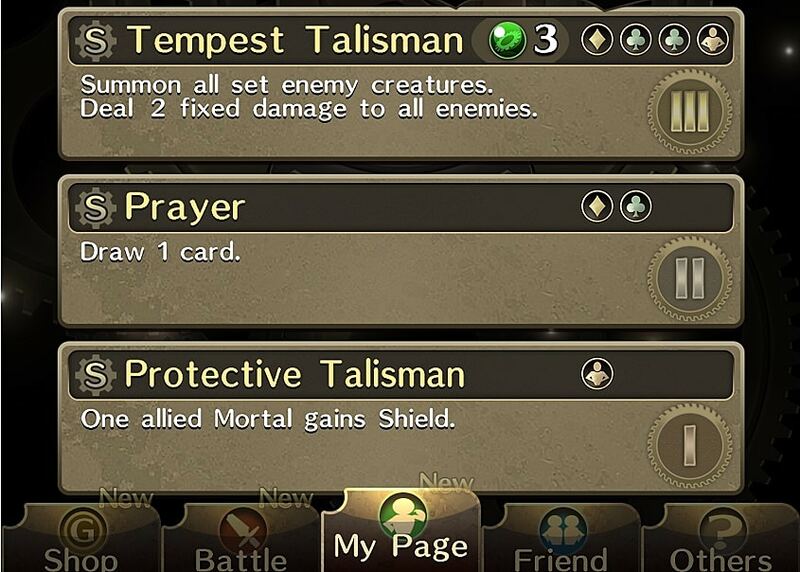 Protective Talisman (Mortal): One allied Mortal gains Shield. Natural Cycle (1 MP, Fae): Restore 1 Life to all allies. Prayer (Diamond, Club): Draw 1 card. Dispel (4 MP, Club, Mortal, Fae): Return one set enemy creature to your opponent’s hand. They gain MP equal to its Cost. Storm Talisman (Diamond, Club, Fae): Deal 3 fixed damage to one enemy. 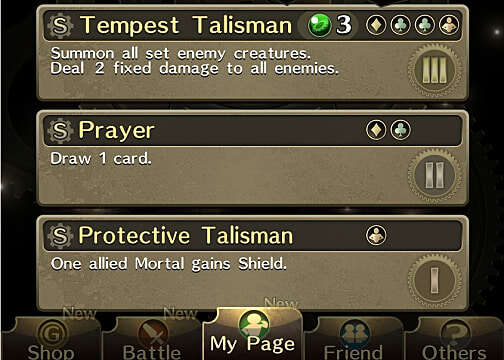 Tempest Talisman (3 MP, Diamond, 2 Clubs, Human): Summon all set enemy creatures. Deal 2 fixed damage to all enemies. Guardian Talisman (1 MP, 2 Diamonds, Club, Fae): All allied creatures gain Shield. Exorcising Blast (2 MP, Diamond, 2 Clubs, Fae): Deal 5 fixed damage to one enemy. Windblade (1 MP, Heart): Deal 2 fixed damage to one enemy. Slap (Fae): Deal 2 damage to one enemy. Wind’s Blessing (Club): You gain 1 MP. Harvest Talisman (Spade, Club): One allied creature gains Shield. Song of Purity (1 MP, Heart, Club, Fae): All allied creatures gain +2 Life. Maiden’s Prayer (1 MP, Spade, Heart, Fae): Draw 2 cards. Tremor (2 MP, Spade, 3 Fae): Deal 1 fixed damage to all enemies. All allied creatures gain +1 Attack. Raging Tempest (1 MP, Spade, Heart, Club, Fae): Deal 4 fixed damage to all enemies. Breath of Life (2 MP, Heart, Club, 2 Fae): All allied creatures gain +1 Attack and +1 Life. Dragon’s Claw (1 MP, Dragon): Deal 3 damage to one enemy. 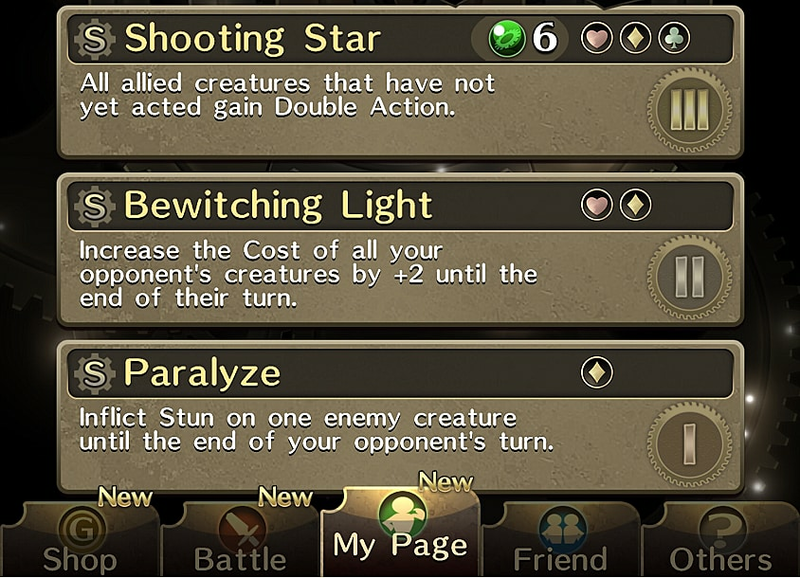 Flare (9 MP, Beast) Deal 7 fixed damage to one enemy. 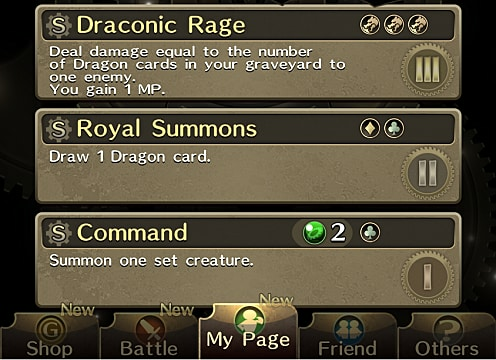 Command (2 MP, Spade): Summon one set creature. Dragon’s Eye (2 MP, Club, 2 Dragons): Inflict Skill Bind on your opponent until the end of their turn. Dragon Aura (1 MP, Spade, Dragon): Increase the Cost of your opponent’s creatures and magic by +1 until the end of their turn. 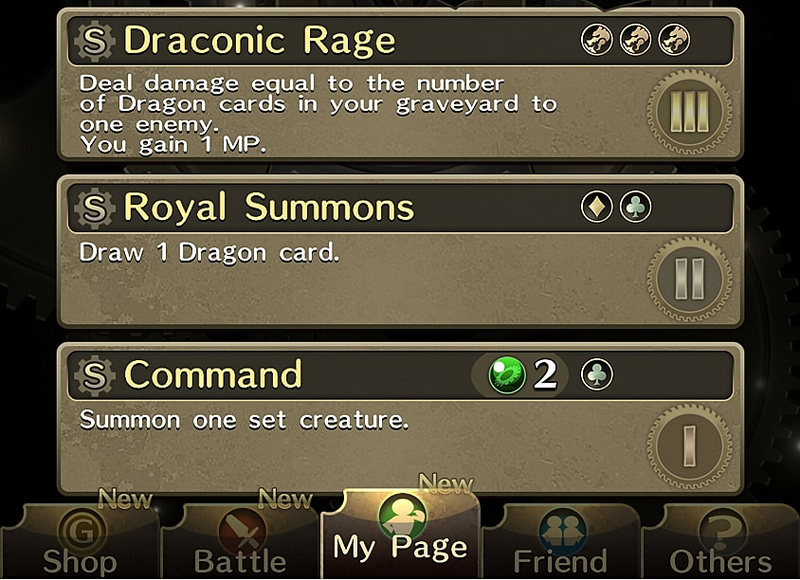 Royal Summons (Diamond, Club): Draw 1 Dragon card. Dragon Breath (Spade, Diamond, Club, Dragon): Deal 5 damage to all enemies. Dragon Queen’s Roar (2 MP, Diamond, Club, Dragon, Beast): All allied creatures gain +2 Attack and +1 Life. Draconic Rage (3 Dragons): Deal damage equal to the number of Dragon cards in your graveyard to one enemy. You gain 1 MP. Hopefully this gives you a better idea of which Gifted suits you best. If you're still not sure how Magia Skills work, check out our guide on Gifted Magia Skills and How They Work! If you have any questions or anything you want to add, leave a comment!